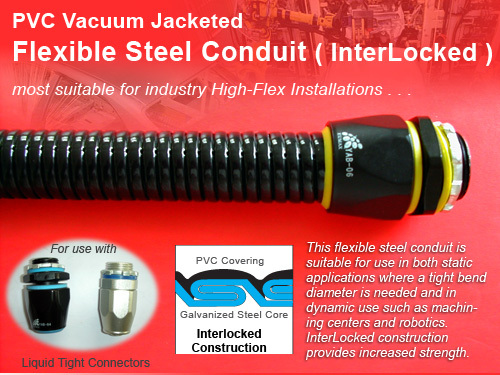 Flexible Steel Reinforced PVC Conduit is designed with an interlocking spirally wound metal armor surrounded with a PVC jacket. The inner armor allows the flexible conduit to be highly resistant to pressure, impact and mechanical stress, while providing superior flexing qualities. The PVC jacket provides resistance against water, oils and acids. All of these features make the Flexible Steel Reinforced PVC Conduit ideal for use in machine and equipment manufacturing with harsh and/or wet environments.